You’d never think that an affordable offering such as the Motorola Moto G with no IP rating or anything will survive being submerged under water for even a few second. When Motorola said it’s wrapping the insides of the phone with a water-resistant nano-coating, many though that’s more of a marketing trick, than anything else. That’s certainly not the case, as YouTube reviewer Erica Griffin has discovered. In fact the phone dived under water for a nudge over 40 minutes and the result is quite shocking. The Moto G survived a 15-second dip and was virtually unaffected by it. Then, a 10-minute dive followed, which resulted in a random crashes, but no issues with the overall functionality. The display, camera, loudspeaker, Wi-Fi and 3G connectivity were working as if nothing happened. But Erica didn’t stop here, as she wanted to see what would happen if the Moto G enjoyed a 30-minute bath. Amazingly, after letting the phone dry for a couple of seconds and the water to get out, everything was fully operational. The battery does get a bit warm at some point, but not really hot. Granted, there was some condensation underneath the camera lens, but after a full night’s rest – the Moto G operated as if it were just unboxed. 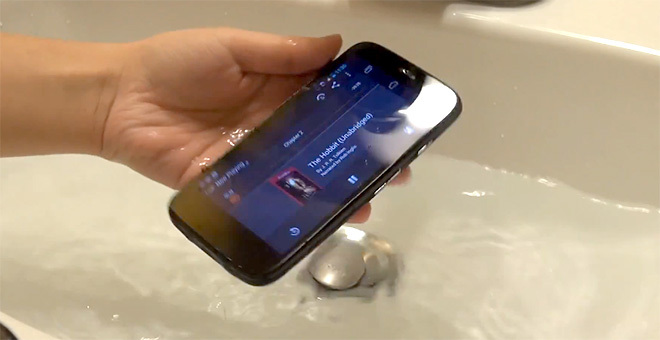 The upshot is that the Moto G is really fully water-proof and doesn’t mind taking long or short baths every now and then.